The figure-eight loop, also called the figure-eight-on-a-bight, is used to form a fixed loop in a rope. It is a middle of the rope knot. The figure-eight retrace knot produces the same result as a figure-eight loop. However, by tying the knot in a retrace, it can be used to fasten the rope to trees or to places where the loop cannot be used. It is also called a rerouted figure-eight and is an anchor knot. STEP 1. Use a length of rope long enough to go around the anchor, leaving enough rope to work with. STEP 2. Tie a figure-eight knot in the standing part of the rope, leaving enough rope to go around the anchor. To tie a figure-eight knot form a loop in the rope, wrap the working end around the standing part, and route the working end through the loop. The finished knot is dressed loosely. STEP 3. Take the working end around the anchor point. STEP 4. With the working end, insert the rope back through the loop of the knot in reverse. STEP 5. Keep the original figure eight as the outside rope and retrace the knot around the wrap and back to the long-standing part. STEP 6. Remove all unnecessary twists and crossovers; dress the knot down. 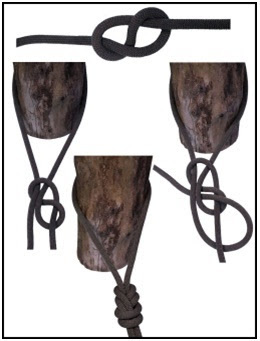 The figure eight slip knot forms an adjustable bight in a rope. It is a specialty knot. STEP 1. Form a 12-inch bight in the end of the rope. STEP 2. Hold the center of the bight in the right hand. Hold the two parallel ropes from the bight in the left hand about 12 inches up the rope. STEP 3. With the center of the bight in the right hand, twist two complete turns clockwise. STEP 4. Reach through the bight and grasp the long, standing end of the rope. Pull another bight (from the long standing end) back through the original bight. STEP 5. Pull down on the short working end of the rope and dress the knot down. STEP 6. 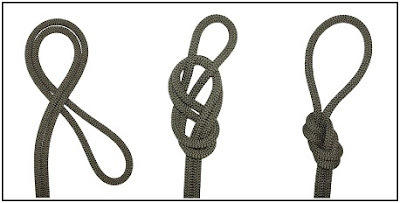 If the knot is to be used in a transport tightening system, take the working end of the rope and form a half hitch around the loop of the figure eight knot.